This month’s questions are a collection of questions I was asked while attending various Christmas parties, or that have been sent to me since the holidays… Please send your training and running questions my way by commenting below. Question: My toes go numb when I run. How can I make this stop? Coach Deb: Toes going numb while on a run can be caused by many different reasons and you’ve got to get to the root of the problem before you can determine how to stop it from happening. Check your gait – do you run on your toes? Are your shoes too tight? Do you have some sort of neuroma that’s putting pressure on the nerves in your toes? Sometimes something as simple as getting larger shoes, custom orthotics, or adding a metatarsal pad to your current orthotics can alleviate the problem. Start by visiting a reputable running store and have them analyze your gait and put you in the right shoe for your foot strike. Once you’re in appropriate shoes, look closely at your gait. If you consistently land and immediately push off of your toes, that near-constant pressure on your toes can cause numbness (and tight calves). If new shoes, pads, and a modification in your gait don’t help, a trip to the doctor may be necessary. When researching for a podiatrist, try to find one who understands the biomechanics of running and is willing to work with you as you continue in your sport. Question: My mom is seventy and would like to start running. Is she too old to start? Another option, if your mom has a smart phone, suggest that she try downloading the C25K app and give that a try. Either way, good luck to your mom! Question: Do I need to stretch before running? Coach Deb: Most experts agree that stretching is best saved for after your run when your muscles are warm and pliable. Prior to running, dynamic stretches are the preferred form of stretching and warming up cold muscles. If you really prefer static stretching prior to your run, start with an easy ten minute warm-up run, stop and stretch, and then continue your run. Question: How can you stand running in the cold? 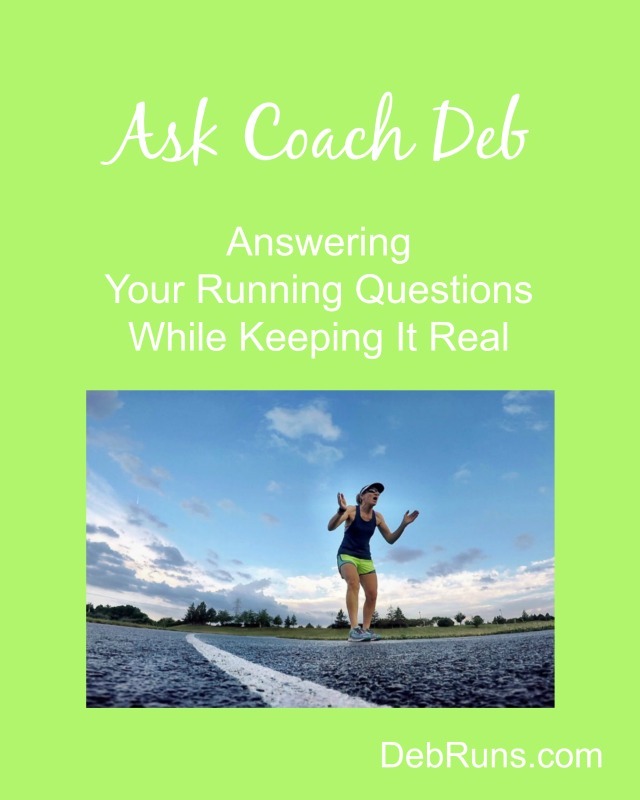 Coach Deb: I get asked this question over and over, and quite honestly, running in the cold is easier than running in the heat. For the most part, winter running is quite delightful after the initial shock of getting out the door and hitting that first blast of cold air. The key to winter running is layering and my Flat Runner Guide to Dressing For Your Run in all temperatures can be very helpful in helping you decide what to wear before heading out in the morning. I prefer to dress for how I’ll feel about a mile into my run when I’ve warmed up so I don’t get overheated during my run. Even with layering, I’d prefer not to have to tie a jacket around my waist unless I absolutely have to. Question: I got a GoPro (affiliate link) for Christmas! How/where do you carry yours when you run? Coach Deb: I carry my GoPro by the selfie stick/tripod like I’m carrying a baton in a relay. If my hand gets tired I simply switch hands. It’s a little less convenient when I’m carrying a hand-held water bottle, but I just switch the GoPro and water bottle between hands just to give each hand a little break from the way I’m holding each item. We Get To Run In Snow! I’ve been running for 50 years, and have had to deal with numb toes for the last few. One thing that happened is my arches fell, and I went up a whole shoe size as a result. Even though I always go to a running store, they tend to recommend a shoe 1/2 size too small for me. The last time I went in, they said my shoes were the right size, but then I showed them my toes, and ordered a shoe 1/2 size larger than what they recommended. Part of the reason could be because I am a “toe lifter” when I run. Anyway, the toes are now feeling much better! So glad you figured out what your problem was and went with your gut instinct… I, too, wear running shoes one full size larger than my regular shoes and find that works best for me as well. Happy running! Yup, yup, yup! I can’t imagine carrying a GoPro for many runs, but I’m sure you get some great shots. I do love the pictures I get with my GoPro! During the winter I don’t carry it with me because I run before the sun comes up and it needs really good lighting for taking good pictures. great q&a! thanks for the winter running tips hoping to finally get this layering thing right in 2017! I have not carried my go pro on runs but I am jealous of your photos with it so I may have to! It took me six months after I got my GoPro before I took the time to learn how to use it! I’m so glad I finally did! Great tips!!! I’d love some more ITB stretching tips! Even though I foam roll, mine always seem tight! Thanks, Michelle! I’ll address IT Band stretches in my next Ask Coach Deb.